This list is CURRENTLY predominately for the Escazu area (but we're starting a list for other areas around Costa Rica so if you have someone to add, info on what to do is below). Their level of English is of varying levels so do yourself a favor & speak SLOWLY (challenging for me to do as I get SOOOO EXCITED!!). Some don't speak English but they are often available & or just GOOD/trustworthy people! I ONLY use LEGAL RED TAXI's & Tourism Vans as they are the ONLY ones that are insured to carry paying passengers plus, if the cops pull them over (& they DO), you're stuck in the middle of no where as the driver can NOT go on!!! HOURS: The hours indicated are the TYPICAL hours they work BUT almost ALL can be flexible by advanced appointment. They can drive you wherever you want to go but you may want to hire ones that have experience/knowledge of an area. DO YOU HAVE A LEGAL DRIVER TO ADD? FYI - Hiring a Red Taxi to pick you up at the airport or return you is more expensive than Airport Taxi's because they spend time waiting for you (time is $$) as well as Greet you with a sign with YOUR name on it, plus they have to pay for parking which ain't cheap at SJO. They also legally can NOT pick up anyone that's not their customer at the airport [they deadhead] so they loose money there. Airport Taxi's are cheaper [around $18 I believe] but my experience is FEW speak English let alone know a lot about areas. 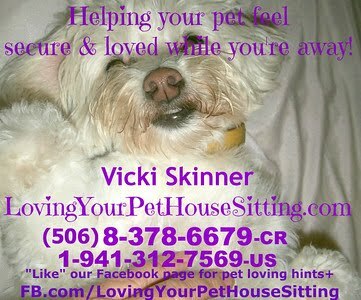 PLEASE TELL EVERYONE “Vicki” referred ya!!! 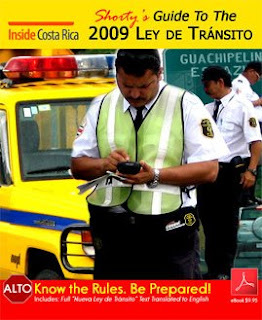 HUGE Changes in new Transit/Driving Laws in Costa Rica 9/23/09 - EDUCATE YOURSELF! I understand her concerns - especially light of the potential problems for more pressure for bribes but I VERY MUCH agree with some of the new laws (I've had NUMEROUS friends, lovers & family DIE from IDIOT drivers which is prolific in CR hence I can't see owning a car here!! I live in the MOST convenient area so I can walk, bus (ok - rarely) or my preferred - taxi which is pretty cheap & SANER!!). THANX Amy for helping to educate us & make OUR lives easier!!!! I think this is WELL worth the investment if you drive or intend on driving in Costa Rica!! Amy Stivers (Shorty) here. Most of you know, I rarely send a mass email. Today is different, as I’m sending you some information on the new changes to the Ley de Transito that will be very very important to you as of September 23rd, 2009. On that date, a sweeping change in the Transit Law takes effect, and all of us need to be prepared. I’ve lived here over 15 years, and this might be the most dramatic change in law that Costa Rica’s attempted in a long while. * 400 new Transito Officers will hit the streets in September 23rd, a 50% increase over the=2 0800 already on the roadways. * All drivers’ licenses will be computerized, and accredited 50 points. When you commit an infraction, you’re issued a $$ fine, but also you get points deducted. The new system is so strict, that running a stop sign only twice can leave you with a suspended license for TWO YEARS. Transito Officials will be communicating to Cosevi central via radio and computer every time someone gets pulled over. It’s expected that citations will be issued following transit accidents as well. A simple fender bender could end up with serious fines issued, and possibly loss of license if you have more than one such situation. * Parents and people who transport children under 12 must have safety seats, and the areas where a child may be seated will be restricted. No more children in the front seat, and no booster seats in the middle area of the back seat, no infant seats in the middle. Does your car support the new regulations? Many par ents are finding that NO, their car won’t be legal to transport all their kids any more. Not complying can get a parent’s license suspended for TWO YEARS, with the first infraction. * You’ll be required to carry a number of new devices in your car at all times, and use reflective vests and triangles any time you perform roadway maintenance, or risk half your license points on the first infraction. Even bicyclists will have to carry new devices, so even if you don’t drive, you really need to inform yourself. * There’s going to be a host of new infractions possible for everyone, including not yielding to a pedestrian in the crosswalk, which will cost you half your license points with one citation. It will take at least one year and possibly up to four years to recover those license points, if you do not commit any new infractions AT ALL. * Foreigners who don’t get a National driver’s license within 90 days of last entry will be fined c68,100 colones now. If you drive a car or motorcycle and haven’t gotten your CR license yet, now is the time to plan it. Needless to say, common sense and first-world driving experience will NOT get you through the new changes without risking some serious fines, and even suspension of your license. Costa Rica has never before REQUIRED any type of training or education to issue their licenses, and now with this law, Costa Rica’s President and Minister of Transport aim to rectify the ignorance, make everyone learn very fast, at the risk of very high fines and of easily losing your license. All Costa Ricans are rapidly re-educating themselves, as should the rest of us. Please inform yourself now, and get prepared so that you are not one of those who falls through the cracks come September. Many people are voicing concerns that so many new officers, so many new infractions, and so much at stake is the perfe ct storm for having Transito Officers running rampant with the solicitation & nbsp;of bribes, and committing abuses. This is a valid concern, and provisions are in place with the new law for appeals an complaints, without all the previous legal legwork that used to be required. We all need to be prepared to know how to appeal citations, how to report abuse by officers, buses, and taxis, and how to pay citations an d renew our licenses. In cooperation with InsideCostaRica.com, I’ve compiled an ebook in English with all this information for use by the English speaking residents here in Costa Rica, as well as those who are researching and planning moving to Costa Rica. You may find it for sale at http://www.InsideCostaRica.com or at http://www.newleydetransito.com for $9.95. Subsequent editions will likely be released as the inevitable legal challenges to the law mount, and adaptations to the law are constructed. There is 50 pages if explanation and illustration of the new changes, new devices, explanation o f the new system, statistics, driving times, and more. Also included is an Annex with the complete Reforma de Ley de Transito translated into English, followed by the complete original document in Spanish. Please inform yourself, and get prepared. It’s called “Shorty’s Guide to the New Ley de Transito 2009”, and in addition, InsideCostaRica.com will be running weekly articles with overviews of different aspects of the new law. InsideCostaRica is a free daily English newsletter and site for Costa Rica, with free daily newsletter emails. You may sign up for the free newsletter with the link towards the top rig ht of the home page, and keep up with the situation. Thank you to all of you for taking the time to read this. I have not put you on a mailing list of any kind, and won't be sending any other emails besides this one. I hope everyone gets themselves informed and prepared for September, so that you suffer no surprises on the roadways.